Last Saturday, I spent the day in Brooklyn with the wonderful spinners from the Floasis. We were out practicing in a park. So of course we put out a hat. Let me tell you. Even when you’re really not trying to busk, once that hat’s out, you’re thinking about it. And think about it I did. I had my canes with me. So the single cane came out in full force. I’d spin that for a bit, take a break, and then come back with some more. No idea how it looked, but I did draw a few interested glances. 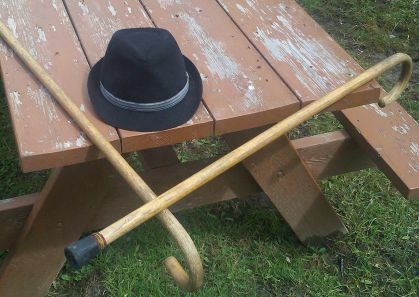 Double cane, on the other hand… I’d pull out the pair for a little bit, get lost, and retreat right back to single cane. Part of it was performance anxiety. Part of it was a sheer lack of vocabulary with the prop. I just found points where I was moving my prop, and I couldn’t seem to figure out how to get it to move to the music. It was very disappointing. Now, two days later and a Monday, the day started out in drizzles. I feared I’d be risking the wet to go out and practice. Then, just in time for lunch, the sun peeked out from behind the clouds. I grabbed the canes and started playing around with them, looking for… Looking for whatever it was that was lacking on Saturday. I did a lot of cane balancing on cane while in motion bits. It didn’t really go anywhere on the way to the diner, but on the way back, something started to crop up. As spinners, we like to flow through our movements, only pausing for effect. The challenge is that the very effort of maintaining the flow can cause us to get lost in our props. Not very good for street. But that flow is what we go for. I’m starting to get a real solid flow with hook-to-hook double cane. But when you’re doing street style spinning, it just takes up too much space. When I was out there in that park in Brooklyn, I was acutely aware of just how much space those canes were taking up. And the other styles just weren’t getting me anywhere. Have you ever tried to balance a stick on your finger? Ever follow it up by balancing a stick on another stick? I’ve been playing with that for over a year now, balancing one stick on another stick, sliding one stick along another stick, twirling one stick around another stick, strikes, traps, etc. That’s what I was doing today. I was playing with those ideas, trying to figure out something. What did it is that I opened up. Put your hand out in front of you. Reach as far out as you can. Move that arm to your side while continuing to reach out. You’ve just made an arc. I started doing just that, tracing circles with my motions while working the canes cane-on-cane style. It started making sense. I still have a long way to go with this style. But the vocabulary for cane-on-cane is slowly coming into focus. I feel like I just barely have enough moves to put together a simple piece. There’s just so much technique to pick up. And that’s without delving into double staff techniques. This entry was posted in Double Cane, Flow Arts and tagged flow double cane, practice, street performance, technique. Bookmark the permalink.